July | 2013 | Woxford Brewing Co.
What to do when you have an empty whiskey barrel? Recently I emptied my whiskey barrel that had a favorite Russian Imperial Stout recipe, Black Metal Stout, from my favorite local brewery, Jester King. With the RIS out of the barrel I knew that I needed another beer to occupy the space fairly soon, lest my barrel turn sour or worse, start leaking. To temporarily keep the barrel clean and leak-free, I’ve kept some vodka inside and rotate the barrel every few days. But the real solution is to brew another beer. In this case, I eventually decided that I should pursue another take on one of my favorite Strong Scotch Ales, Old Chub from Oscar Blues brewery. Previously I had soaked oak spirals in Isle of Islay single malt scotch whiskey. To continue that concept I decided that we’d age some Old Chub in the whiskey barrel. This Friday I’ll be brewing up Old Chub, 11 gallons of it, and pitching a 4 Liter starter of White Labs Cali Ale (001) and then in about two weeks I’ll rack everything that fits into the whiskey barrel. 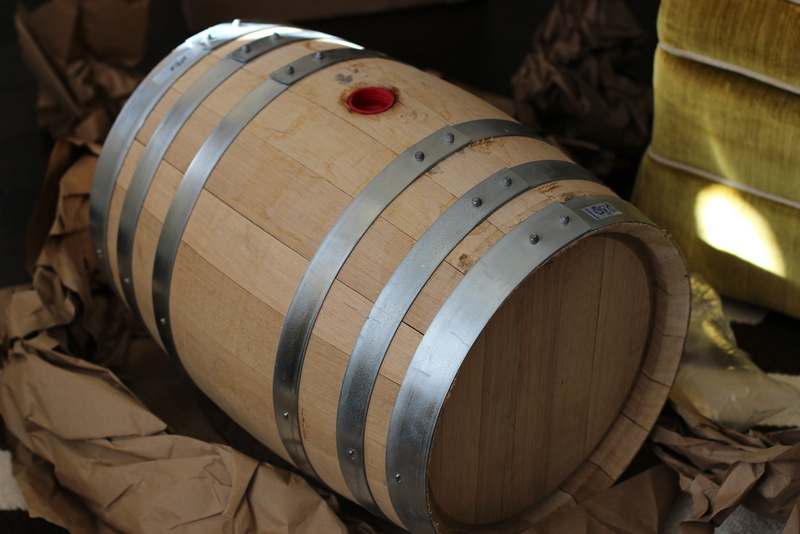 The first beer in the barrel stayed about three months and pulled a significant amount of whiskey flavor and aroma. I decided that I wanted enough flavor and aroma to stick around for a while since I bottled half of the batch in 750ml containers for long term storage and natural carbonation. It will be interesting to see how long it takes to get a nice whiskey aroma and flavor in the Old Chub; I’m guessing roughly the same time since Old Chub is less roasty than a RIS. Sour-mashing 12 gallons of work in a Blichmann 20G kettle. 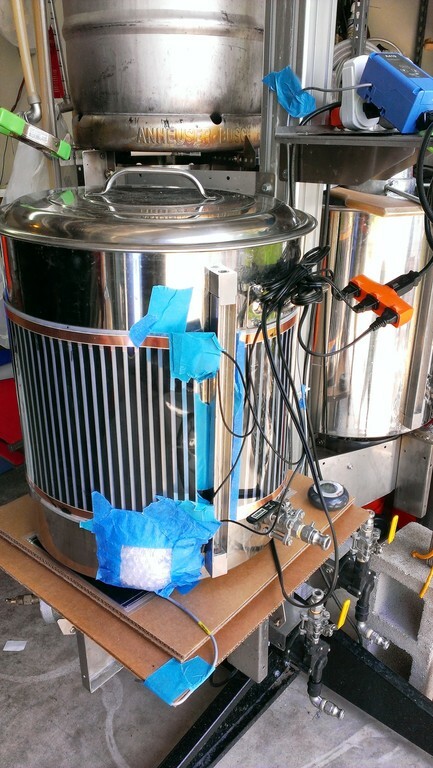 Heat-belts and temp controller to keep temp between 115 and 120F. I brewed my first sour-mashed Berliner Weisse back in January this year on my dreaded double-brew day which involved doing a quick 30 minute boil and chill while trying to mash a Flanders Red. Patience grasshopper. I aged the first Berline Weisse, MomoSuppai on 10 pounds of frozen peaches resulting in a very nice, light, peachy beer. The only real criticism was that it needed more sour to it. The original had about 48 hours of time with a pure Lactobacillus culture at 120F degrees. In my notes, I said next I’d let it sour longer. That time as come. In addition to the desire for more tartness, I also wanted more volume. The first 5 gallons went way too fast, so the only thing to do was to bump up the volume. The challenge was how to sour mash the larger volume. 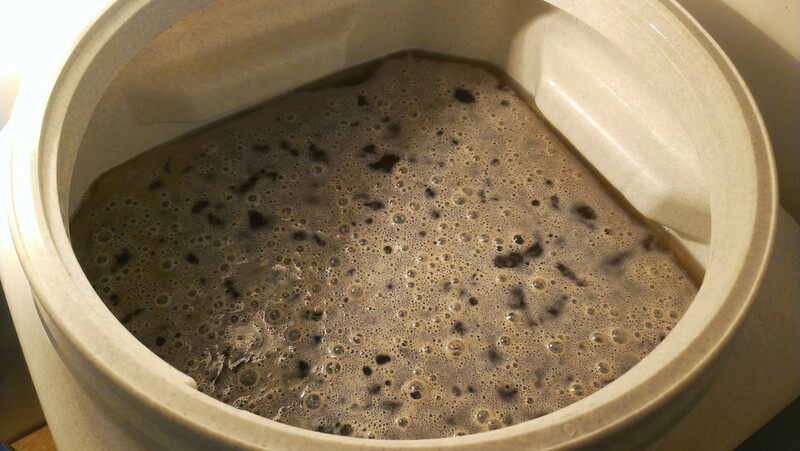 The sour mash process I follow has the mashed wort held at close to 120F for as many days as you like after pitching a pure culture of Lactobacillus. The pure culture helps ensure that many of the off-flavors that can come from other bacteria don’t make it into the beer versus the traditional method of pitching in uncrushed grain which carries tons of bacteria. I picked up some additional heat belts which I’ve used before to ensure proper temp control for the sour mash and they worked very well… almost too well as this time around I ended up pushing the temp up to 130F, not on purpose. I ended up toss in two handfuls of some uncrushed grain just in case the higher temp killed of the lab lacto. The result after 5 days was an intensely sour wort, hitting 3.2 pH. On the offical brewday, the wort was boiled for about 30 minutes with a tiny addition of cascade, chilled to pitching temp and that’s it. The next challenge for this beer was getting fermentation going. I originally pitched one package of S-05 dry yeast. I had seen in many places that dry-yeast packets tend to have significantly more yeast cells than liquid yeast. The yeast pitching rate calculator indicated that I needed just over 250 billion yeast for 12 gallons of 1.031 S.G wort. Surely one packet would be enough. After two days though there was no sign of fermentation. While I wasn’t panicking, I was worried. Looking around, I saw some more discussion about making sure you pitched heavily in an acidic environment so I promptly pitched another 3 packets of dry-yeast. A day later, I was rewarded with a nice krausen on the surface. Thin krausen forming after pitching 5 packets of S05 dry-yeast. After a week of fermentation, the beer is down to 1.010 S.G, so a little more to go. After terminal gravity, I’ll split the batch and age on BlackBerry and Apricot puree to try out some new fruit flavors in the beer. The recipe is just a scaled-up version of the original. Pitched 2 vials of WLP Lacto into 12+ gallons of 1.031 wort. Low on C02 so blanket wasn't as good as I'd like. Initial temp was 105F, in 12 hours was at 124F. Heavily wrapped with bottom heater and two layers on the side. Checked temp again after unwrapping blankets, and temp was up to 125. I opened up the top and stirred, temp rose to 130F as the heat got distributed. Sanitized two ice bottles and left in for 2 hours to bring temp down to 113F. Plugged all 3 controllers back in and set temp for 117F. Wednesday morning (48 hours) ph is 3.77 @ 28C. Taste is slightly acidic, very light, not enough punch. New batch of co2 used to blanket it and also added two handfuls of 2-row grain uncrushed hoping to kick up some more bacterial activity. Friday Morning, ph is 3.28 @ 23C. Taste is decidedly sour. on it's way to being quite potent. Nose is lactic with some buteryc funk... probably from tossing the the 2-row. Hoping to push the tar over the top by 6PM tonight. Saturday, ph is 3.29 @ 23C. No ferm activity. Pitched second packet of yeast. Sunday, ph is 3.29 @ 23C. No ferm activity. Gravity shows some movement, 1.035 -> 1.031. Two packages is still under pitched according to new yeast calculators, so picked up 3 more packets (5 * 11.5 grams in total). Pitched the rest, stirred up fermentor to resuspend the yeast. Monday, very thing, but bubbly krausen on surface of wort. 2013-07-11, Krausen thining out, gravity check: 1.008 @ 71.9F -> 1.010 S.G. Nose is lacto and some heavy funk, like stinky feet. Aroma fades to simple lacto, wheat, sour. Taste is very very nice. A bit think mouth feel, slightly carbed, excellently sour, peachy, wheat. appearence is nearly 2 or 3 SRM, quite cloudy, no yeast flavors. Carbonation and fruit will go very well. Hoping the funky feet aroma moves on or is over powered by fruit additions. No hop flavor or aroma. 48 hour @ 120F after pitching lacto. Measured pH of 4.0. Boiled for 30+ minutes, to hit target volume (6.5 post-boil/pre-chill). Got 6G in carboy. Low on ice, so only chilled to about 80F, put in fridge to chill and pitched two packets of 1056 around 10PM. Racked into 13G plastic fermentor and pitched 10# of peach pureee. After 2 weeks, a new lacto pelical formed. Racking the puree was difficult, lost about 1 gallon of volume. Next time need to use some sort of bag or figure out a better separator for the fruit.